Amazing Photographs That Changed the World :The following photographs screamed so loudly that the entire world stopped to take notice. Any picture can speak 1,000 words, but only a select few say something poignant enough to galvanize an entire society. 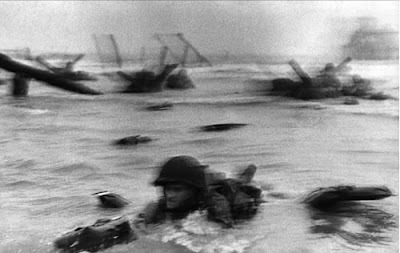 "If your pictures aren’t good enough," war photographer Robert Capa used to say, "you aren’t close enough." Words to die by, yes, but the man knew of what he spoke. After all, his most memorable shots were taken on the morning of D-Day, June 6, 1944, when he landed alongside the first waves of infantry at Omaha Beach. In an ironic twist, however, that same mistake gave the few surviving exposures their famously surreal look ("slightly out of focus," Life incorrectly explained upon printing them). More than 50 years later, director Steven Spielberg would go to great lengths to reproduce the look of that "error" for his harrowing D-Day landing sequence in "Saving Private Ryan," even stripping the coating from his camera lenses to echo Capa’s notorious shots. As era-defining photographs go, "Migrant Mother" pretty much takes the cake. 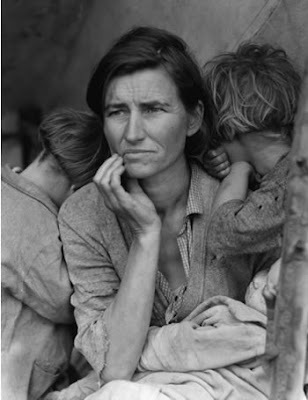 For many, Florence Owens Thompson is the face of the Great Depression, thanks to legendary shutterbug Dorothea Lange. Lange captured the image while visiting a dusty California pea-pickers’ camp in February 1936, and in doing so, captured the resilience of a proud nation facing desperate times. Unbelievably, Thompson’s story is as compelling as her portrait. Just 32 years old when Lange approached her ("as if drawn by a magnet," Lange said). Thompson was a mother of seven who’d lost her husband to tuberculosis. Stranded at a migratory labor farm in Nipomo, Calif. her family sustained themselves on birds killed by her kids and vegetables taken from a nearby field - as meager a living as any earned by the other 2,500 workers there. The photo’s impact was staggering. Reproduced in newspapers everywhere, Thompson’s haunted face triggered an immediate public outcry, quickly prompting politicos from the federal Resettlement Administration to send food and supplies. Sadly, however, Thompson and her family had already moved on, receiving nary a wedge of government cheese for their high-profile misery. In fact, no one knew the identity of the photographed woman until Thompson revealed herself years later in a 1976 newspaper article. 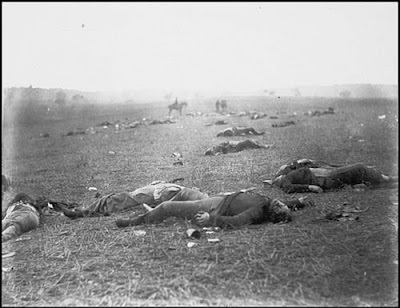 "Federal Dead on the Field of Battle of First Day, Gettysburg, Pennsylvania"
In fact, Brady had everything to lose by making a career move - his money, his business, and quite possibly his life. Nevertheless, he decided to risk it all and follow the Union Army into battle with his camera, saying, "A spirit in my feet said, ‘Go!’" And go he did - at least until he got a good look at the pointy end of a Confederate bayonet. After narrowly escaping capture at the first Battle of Bull Run, Brady’s chatty feet quieted down a bit, and he began sending assistants in his place. In the span of only a few years, Brady and his team shot more than 7,000 photographs - an astounding number when you consider that developing a single plate required a horse-drawn-wagon-full of cumbersome equipment and noxious chemicals. Not exactly what you’d call "point-and-shoot." 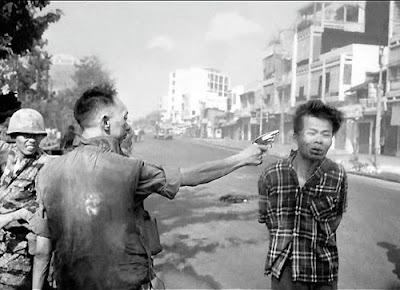 "Murder of a Vietcong by Saigon Police Chief"
"Still photographs are the most powerful weapon in the world," AP photojournalist Eddie Adams once wrote. A fitting quote for Adams, because his 1968 photograph of an officer shooting a handcuffed prisoner in the head at point-blank range not only earned him a Pulitzer Prize in 1969, but also went a long way toward souring Americans’ attitudes about the Vietnam War. For all the image’s political impact, though, the situation wasn’t as black-and-white as it’s rendered. What Adams’ photograph doesn’t reveal is that the man being shot was the captain of a Vietcong "revenge squad" that had executed dozens of unarmed civilians earlier the same day. Regardless, it instantly became an icon of the war’s savagery and made the official pulling the trigger - General Nguyen Ngoc Loan - its iconic villain. Sadly, the photograph’s legacy would haunt Loan for the rest of his life. Following the war, he was reviled where ever he went. After an Australian VA hospital refused to treat him, he was transferred to the United States, where he was met with a massive (though unsuccessful) campaign to deport him. He eventually settled in Virginia and opened a restaurant but was forced to close it down as soon as his past caught up with him. Vandals scrawled "we know who you are" on his walls, and business dried up. Adams felt so bad for Loan that he apologized for having taken the photo at all, admitting, "The general killed the Vietcong; I killed the general with my camera." 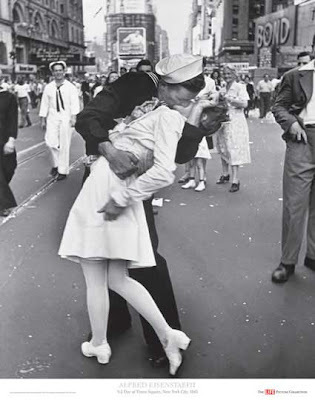 "V-J Day, Times Square, 1945", a.k.a. "The Kiss"
Of course, a photo of the sailor planting a wet one on a senior citizen wouldn’t have made the cover of Life, but when he locked lips with an attractive nurse, the image was circulated in newspapers across the country. Needless to say, "V-J Day" didn’t capture a highly anticipated embrace by long-lost lovers, but it also wasn’t staged, as many critics have claimed. In any case, the image remains an enduring symbol of America’s exuberance at the end of a long struggle. In the grand scheme of things, however, the Hindenburg wasn’t all that disastrous. Of the 97 people aboard, a surprising 62 survived. 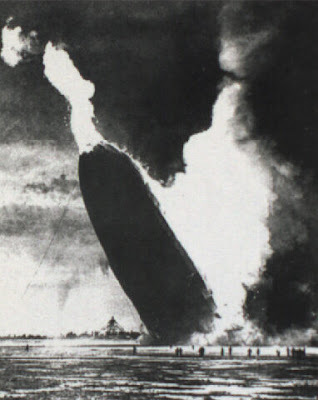 (in fact, it wasn’t even the worst Zeppelin crash of the 20th century. Just four years earlier, the U.S.S. Akron had crashed into the Atlantic killing more than twice as many people.) But when calculating the epic status of a catastrophe, terrifying photographs and quotable quotes ("Oh, the humanity!") far outweigh body counts. 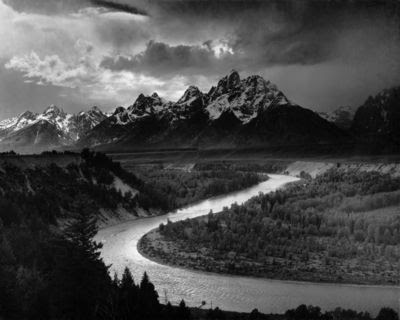 "The Tetons - Snake River"
Some claim photography can be divided into two eras: Before Adams and After Adams. In Times B.A., for instance, photography wasn’t widely considered an art form. Rather, photographers attempted to make their pictures more "artistic" (i.e., more like paintings) by subjecting their exposures to all sorts of extreme manipulations, from coating their lenses with petroleum jelly to scratching the surfaces of their negatives with needles. Then came Ansel Adams, helping shutterbugs everywhere get over their collective inferiority complex. Brashly declaring photography to be "a blazing poetry of the real," Adams eschewed manipulations, claiming they were simply derivative of other art forms. Instead, he preached the value of "pure photography." In an era when handheld point-and-shoot cameras were quickly becoming the norm, Adams and other landscape photographers clung to their bulky, old-fashioned large-format cameras. Ultimately, Adams’ pictures turned photography into fine art. What’s more, they shaped the way Americans thought of their nation’s wilderness and, with that, how to preserve it. "The Corpse of Che Guevara"
Sociopathic thug? Socialist luminary? Or as existentialist Jean-Paul Sartre called him, "the most complete human being of our age"? Whatever you believe, there’s no denying that Ernesto "Che" Guevara has become the patron saint of revolutionaries. Undeniably, he is a man of mythical status - a reputation that persists less because of how he lived than because of how he died. But by killing the man, Bolivian officials unwittingly birthed his legend. The photo, which circulated around the world, bore a striking resemblance to Renaissance paintings of Christ taken down from the cross. 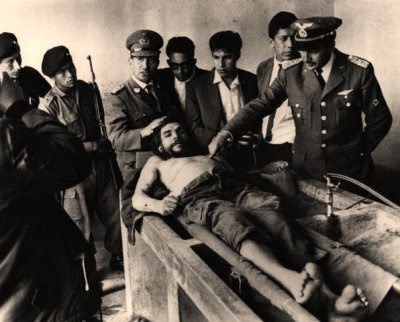 Even as Che’s killers preened and gloated above him (the officer on the right seems to be inadvertently pointing to a wound on Guevara’s body near where Christ’s final wound was inflicted), Che’s eerily peaceful face was described as showing forgiveness. The photo’s allegorical significance certainly wasn’t lost on the revolutionary protesters of the era. They quickly adopted "Che lives!" as a slogan and rallying cry. Thanks to this photograph, "the passion of the Che" ensured that he would live on forever as a martyr for the socialist cause. 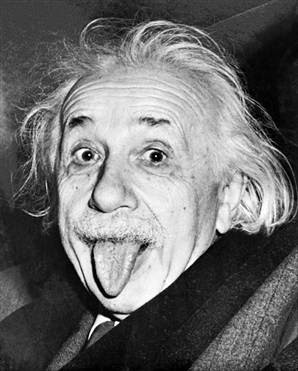 "Einstein with his Tongue Out"
You may appreciate this memorable portrait as much as the next fellow, but it’s still fair to wonder: "Did it really change history?" Rest assured, we think it did. While Einstein certainly changed history with his contributions to nuclear physics and quantum mechanics, this photo changed the way history looked at Einstein. By humanizing a man known chiefly for his brilliance, this image is the reason Einstein’s name has become synonymous not only with "genius," but also with "wacky genius." Philippe Halsman is quite possibly the only photographer to have made a career out of taking portraits of people jumping. But he claimed the act of leaping revealed his subjects’ true selves, and looking at his most famous jump, "Dalí Atomicus," it’s pretty hard to disagree. 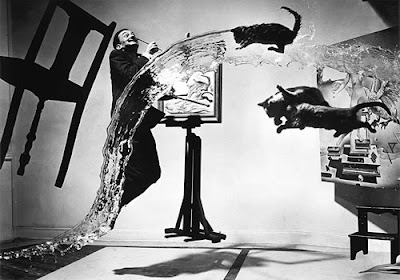 The photograph is Halsman’s homage both to the new atomic age (prompted by physicist’ then-recent announcement that all matter hangs in a constant state of suspension) and to Dalí’s surrealist masterpiece "Leda Atomica" (seen on the right, behind the cats, and unfinished at the time). It took six hours, 28 jumps, and a roomful of assistants throwing angry cats and buckets of water into the air to get the perfect exposure. Halsman’s methods were as unique as they were effective. His celebrity "jump" portraits appeared on at least seven Life magazine covers and helped usher in a new - and radically more adventurous - era of portrait photography. 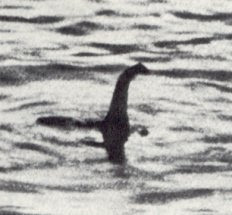 While strange sightings around Scotland’s murky Loch Ness date back to 565 C.E., it wasn’t until photography reached the Loch that Nessie Fever really took off. The now-legendary (and legendarily blurry) "surgeon’s photo," reportedly taken in April of 1934, fueled decades of frenzied speculation, several costly underwater searches, and a local tourism industry that rakes in several million dollars each year. But the party almost ended in 1994, when a report was published saying that model-maker Christian Spurling admitted to faking the photo. According to Spurling’s statement, his stepfather, Marmaduke Wetherell, worked as a big game hunter and had been hired by London’s Daily Mail to find the beast. But rather than smoke out the creature, he decided to fake it. Wetherell, joined by Spurling and his son, Ian, built their own monster to float on the lake’s surface using a toy submarine and some wood putty. Ian actually took the photo, but to lend more credibility to the story, they convinced an upstanding pillar of the community - surgeon Robert Kenneth Wilson - to claim it as his own. Just goes to prove the old adage, "The camera never lies." People, on the other hand, do. "Gandhi at his Spinning Wheel"
"Gandhi at his Spinning Wheel," the defining portrait of one of the 20th century’s most influential figures, almost didn’t happen, thanks to the Mahatma’s strict demands. 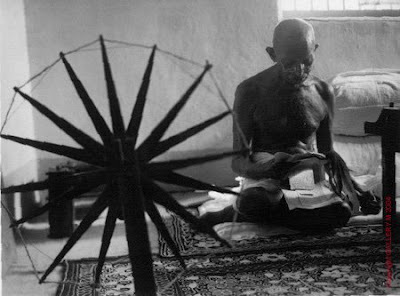 Granted a rare opportunity to photograph India’s leader; Life staffer Margaret Bourke-White was all set to shoot when Gandhi’s secretaries stopped her cold: If she was going to photograph Gandhi at the spinning wheel (a symbol for India’s struggle for independence), she first had to learn to use one herself. But that wasn’t all. The ascetic Mahatma wasn’t to be spoken to (it being his day of silence.) And because he detested bright light, Bourke-White was only allowed to use three flashbulbs. Having cleared all these hurdles, however, there was still one more - the humid Indian weather, which wreaked havoc on her camera equipment. When time finally came to shoot, Bourke-White’s first flashbulb failed. And while the second one worked, she forgot to pull the slide, rendering it blank. Before there was photoshop, there was Man Ray. One of the world’s most original photographers, Ray was tireless experimenter. In fact, his work was so inventive that he eventually left the camera behind altogether, creating his surreal "Rayographs" entirely in the darkroom. "Le Violon d’Ingres" is perhaps his best-known photograph, and one of his earliest. Like many pieces from the Dada movement (which Ray is credited with bringing to the United States), it’s a visual pun. 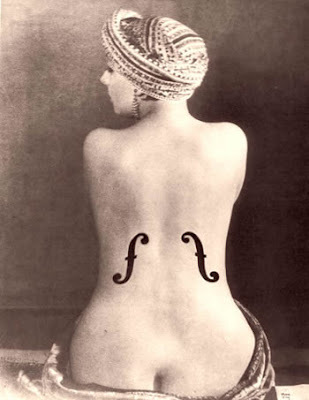 By drawing f-holes on his model’s back, he points out the similarities between the body of a woman and the body of a violin. But it’s a literal pun, as well. Both the model’s dress and pose echo a famous painting by French artist Jean-Auguste-Dominiqe Ingres, whose hobbies were depicting female nudes and playing the violin.